There are many reasons why a home could need a door makeover. 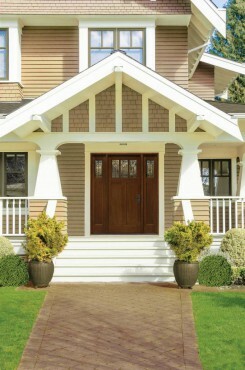 Entry doors, like other major components of the home, can wear out over time and need to be replaced. Additionally, homeowners may “inherit” a door on a home they’ve recently purchased and wish to change the style to a better one in order to complement their home’s personality. In fact, entry door replacement consistently ranks among the most valuable remodeling projects in the annual “Cost vs. Value Report,” published by Remodeling magazine. The experts at Therma-Tru are offering tips for evaluating your current door, and insights on door aesthetics and components. Touch your door. If you can feel the exterior temperatures from the inside, you may not have adequate insulation. Also check its appearance. For wood doors, check for warping or rotting. For steel, check for dings and rust. Final item: Does the style of your door match the design of your home? A door is actually a system of various components. Locks should operate smoothly and be strong enough to help protect your home. A multipoint locking system that engages a series of locks at several places on the frame can offer peace of mind. Doors experience wear and tear over time. Be sure any replacement door you purchase is constructed and tested to withstand harsh treatment. Consider materials such as fiberglass, which can offer the beauty of such classic materials as wood, while being low-maintenance and long-lasting. Curb appeal isn’t just a buzzword. It’s the wow factor people get when they drive by your home and the cozy feel that welcomes guests to come in and stay a while. Try a paintable fiberglass door to add a pop of color or stick to the classic look of wood grain, which, when stained, adds warmth. Either way, you can make your home’s entryway stand out with a door trim surround kit, such as those from Fypon, as well as decorative or privacy glass for doorlites and sidelites. Home begins at the front door. Take steps to give your home a grand entrance by upgrading this important feature. For detailed tips on evaluating your current door for form and function, and insights on making future door purchases, visit ThermaTru.com.